There’s more than one type of identity ‘crisis’. 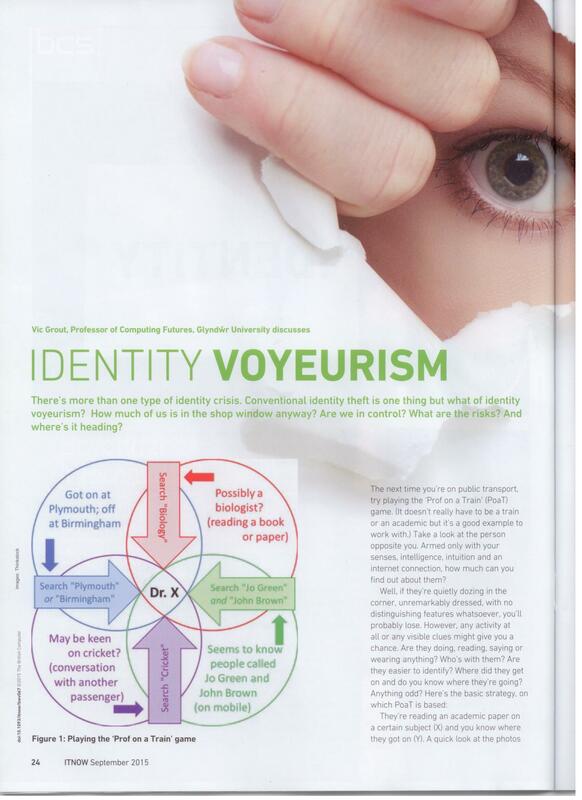 Conventional identity ‘theft’ is one thing but what of identity ‘voyeurism’? How much of ‘us’ is ‘in the shop window’ anyway? Are we in control? What are the risks? And where’s it heading? The next time you’re on public transport, try playing the ‘Prof on a Train’ (PoaT) game. (It doesn’t really have to be a train or an academic but it’s a good example to work with.) Take a look at the person opposite you. Armed only with your senses, intelligence, intuition and an Internet connection, how much can you find out about them? They’re reading an academic paper on a certain subject (X) and you know where they got on (Y). A quick look at the photos on the ‘Department of X’ webpage for the ‘University of Y’ might be enough.